Department Printers are used to print Order Slips. An example would be the kitchen printer. If your retail shop has a take-away section, you can print orders for the kitchen to the kitchen printer. Your shop might have a store room where some bigger items are stored. When a purchase for one of these items are done, you can print a order slip to the store room so that the purchased item can be collected. 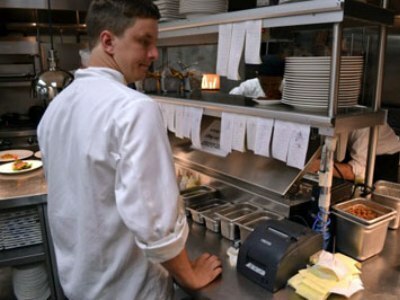 For information on how Order Slips work for a Restaurant, see Restaurant Order Slips. To use a department printer, go to Manager > Main Setup > Department Printers. 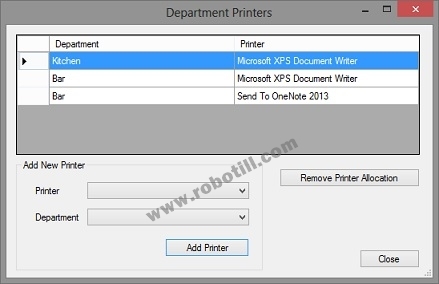 You can allocate a printer to each department or only to the required departments. You can also allocate more than one printer to a specific department. Note that when selecting the printer it is important to use the name as it will be seen from all computers on the network. Some network printers when installed from another computer will also include the IP address as part of the printer name. If that is the case, you could select the printers from another computer (not the one where the printers is locally installed) so that the IP address is included as part of the name. Each time a sale is done and items for that department is part of the sale, a order slip will be printed on that department printer with only the items for that department that is part of the current sale.